Christine Benz: Hi, I'm Christine Benz for Morningstar.com. With both stocks and bonds performing reasonably well in 2014, investors may be wondering what's next. 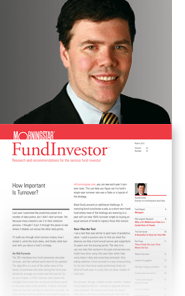 Joining me to share some ideas is Russ Kinnel; he is director of manager research for Morningstar. Russ, thank you so much for being here. Russ Kinnel: Good to be here. Benz: Russ, in your latest issue of Morningstar FundInvestor, you talked about the macroeconomy--some headwinds that could lie ahead for the markets. One idea that you keyed in on is this idea of falling energy prices, which has knocked down stocks and some bonds recently. You think Fidelity High Income (SPHIX), though, is an idea for investors who are looking maybe for a fund that will come back strongly if energy prices rebound. You think that this is potentially one to give a look. Kinnel: Right. Obviously, falling oil prices are a good thing for a lot of industries, but very obviously not for energy. And energy is a big part of the high-yield market; it's about 15%. So naturally, high-yield funds have been selling off. We're seeing redemption from investors. So, at some point, I think that becomes a buying opportunity. Maybe not Jan. 1. Maybe [you'll want to wait a little longer]. But Fidelity High Income is one of our favorite high-yield funds, so I think it's a good watchlist addition. Fred Hoff doesn't buy a lot of stocks, doesn't buy the junkiest stuff. But he still takes some risk--some credit risk. So, that explains why the five-year returns aren't great on the fund. But if you look at how it has performed when the credit cycle rolls over and lower credit gets hit, it has done really well. It has very good long-term performance. So, it's a good fund to look at during the year, especially if the high-yield sell-off gains momentum. Benz: So, if you had a core bond portfolio, this would be something to own as a satellite holding or maybe even think of it as tame equity exposure? Kinnel: For sure. It's definitely a lot higher risk than your typical bond fund because you are buying low-credit stuff where you have a lot of leverage. And obviously, if the economy rolls over, there is a problem; but also, in this particular case, energy companies are going to have a hard time making their payments, and that's obviously a concern that's going to be reflected in the market. So, there is going be a lot of turmoil next year. Benz: Another idea, in a related vein, is Matthews Asian Growth and Income (MACSX). Let's talk about the long-term case for the fund as well as how perhaps, in the short term, you think that falling energy prices might be something that they can capitalize on as well. Kinnel: Right. Most Asian economies are net importers of oil, so falling oil prices are a tremendous benefit to them. Matthews Asian Growth and Income is a really good way play it because, (one) it's a cheap fund, (two) Matthews has tremendous Asia expertise, and (three) the growth in income means not just equity but also convertible bonds, preferreds, and even with the equities, they buy dividend payers. And what that means is it's a lower-risk approach to investing in Asia; the fund tends to lose less in a downturn. So, I like both the upside and the downside protection in a fund like that. Benz: Here again, this would be something that you'd want to keep to a fairly small slice of your portfolio. Kinnel: Most definitely. Even though it's on the conservative side of that peer group, it's still a more volatile, higher-risk area. So, it's not a core holding. Benz: Let's talk about another idea. This is a broader idea, a longtime favorite here at Morningstar: Artisan International (ARTIX). Let's talk about what you think is the case for the fund going forward; it has been a very strong long-term performer, but what do you think is good about it in the long term, going forward? Kinnel: Falling oil prices are a benefit for Europe and Japan, where most of [the fund's] money is. I think also Europe stocks are relatively cheap, but cheap for a reason: There is no growth in Europe. So, let's find a growth manager like Mark Yockey, who can find some European names with decent growth prospects. He's got things like Rolls-Royce, an engine maker, he's got some drug companies, some tech companies. So, there is some modest growth there, even though Europe as a whole is looking fairly stagnant. Benz: Another idea: This one is based not so much on the macroeconomy, but you think it's a fund that has an interesting fundamental story. There's been a big manager shift going on here over the past few years. This is Meridian Growth (MRIGX). And before we get into it, you just want to make the point that it has a pretty high minimum, so this is [a fund that only] very high-net-worth folks could consider at this point. Kinnel: That's right. Some people got into it before they shut down the lower-investment share class; but otherwise, it's got a $100,000 minimum, so apologies to those who can't get in. [Correction: Meridian Growth offers a share class (MRAGX) with a $2,500 minimum investment.] But I think it's a really interesting story. Brian Schaub and Chad Meade from Janus Triton (JATTX) came over to run this out of Arrowpoint Partners, which then bought Meridian. So, you have a tremendous manager upgrade. They did a great job at Triton; now they've got a relatively small fund to manage. So, I see tremendous potential in a fund like this. And then on top of that, obviously, small caps have come back a bit lately. Benz: Come down a bit. Kinnel: So, it's a bit more of a buying opportunity as well. Benz: The last idea, I think, is [an all-seasons kind of fund]. Whatever happens, this fund should be pretty well situated. This is FPA Crescent (FPACX); let's talk about the story there. And Russ, I'm also hoping you can address the size issue, because the fund has gotten pretty large as it's gained in popularity--its performance has been really good. Kinnel: FPA Crescent is a fund run by Steve Romick. Tremendous long-term track record. But he is a very conservative investor. So, he'll look anywhere in the capital structure, bonds, stocks--whatever--to find good risk/reward opportunities. So, he tends to buy a chunk of stocks, holds a lot of cash, and then has some bonds or some other really unusual creative opportunities. But it's a strategy that means the fund tends to lose less in downturns. And we talked about what may be cheap--U.S. large caps are probably a little on the pricey side. So, I like the idea of a U.S.-equity-focused fund that's more conservative. It has some good downside protection, yet just a really good long-term holding. You mentioned asset size, and that is a concern. I would love to see this fund close. It does have a wide purview between cash, bonds, just about any U.S. equity. So, it has a fair amount of capacity, but it's gotten big. And I think, as assets grow, it has to forgo a little of the opportunities in small and mid-cap names. So, I don't write that out. I think it's still a good fund, but you're right: Growing assets will slowly diminish the appeal a bit. Benz: Russ, thank you so much for being here to share these ideas.